my own modern version of a story based on the book of job. 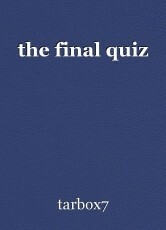 THE ULTIMATE QUIZ Five brilliant atheist scientists find themselves standing at Heaven's Gate. Much to their sheer amazement and shock, they are greeted and welcomed by Archangel Michael asked: "Are you all ready to enter into Eternity? The scientist all responded with an enthusiastic: "Yes we are!" 'Let me first explain: There are 10 Levels of Eternity: Level #10 offers the Maximum Benefit Package, where as Level #1, the lowest.' The scientists stated they would settle for nothing less then Level #10. Michael, then said: 'Being placed in Level #10 is conditional. You are required you take a 20 question quiz and score 100%; if you fail the test, you will be given the option to take the test again; in order to do so, however, you must return to earth (as a newborn) and start another life. Only upon your death, will you again be transported to us for re-testing. Should you choose not to take the test again or fail the second time, means an automatically placement in Level #1 which I will explain later on. If this is fully understood, I'd like to ask you to please sign this Agreement Form.' The scientist read and signed the form. Michael then said: 'Very well then, please follow me.' The five scientists were led to long circular table with five chairs. There were five little booklets placed above each chair on the table. 'Here are your test questionnaires. Kindly place your full name at the top right hand comer of the quiz. You have 30 minutes by which to complete this quiz. If you do not answer a question, do not continue; it will result in an automatic disqualification. At the conclusion of the 30 minutes, I will grade and return the tests; they will be marked either Pass or Fail. Do well! 1.Who chose the colors of the rainbow? 2.Have far does the universe go? 3.Where do the winds originate from? 4.How does the brain generate consciousness? 5.Where are the limits of human life and physiology? 6.Can damaged brain parts be replaced with computational devices? 7.Who determined the measures of the earth? 8.Where is the way where light dwells and the abode of darkness? 9.Do you know the ordinances of the heavens? 10.Who provides for the raven its prey? 11.Who chose the colors of the sky, trees, and clouds? 12.Who designed the animals that roam the earth? 13.To whom has the gates of death be revealed? 14.By what way is the light distributed? 15.How is the east wind spread over the earth? 16.Who prepared a channel for the to tents of rain or the path for a thunderbolt? 17.How would you lead forth the signs of the zodiac in their season? 18.Who has given the horse its might?· 19.Who commands an eagle to make his nest on high? 20.Who determines life and who determines death? © Copyright 2019 tarbox7. All rights reserved. This page was created in 0.3370 seconds.